With more Regina Security & Automation Companies to choose from and promoting a variety of Security Packages, we think it's important that you focus on the level of protection that is right for your home. The best Regina Security & Automation Companies work closely with you, and make recommendations based on the layout of your home and the way you will be using your Security & Automation system. Do you have pets? Where are they allowed to go in the home, and when? Do you have children? How old are they, and what issues will you face integrating a residential security system into their lives? Will you arm your system when you are at home? Many people do so (growing numbers, in fact), and that can impact your choice and placement of security sensors. Are there areas of the home where you don’t go at night? A basement is a great example, and that can influence the sensors you use there. There are other questions, of course, and a reputable Regina Security & Automation Company can help you work through all of them. But the main point is that every system should be customized: not just for how your home is laid out, but also for your lifestyle. This is no time for a “one–size-fits-most” approach! One thing we want to address up front is that most up to date alarm systems can be armed in either of two modes: “Stay” and “Away.” In the “Stay” mode, often used when you are home at night, only the perimeter (entry/exit) is armed, and you can move about freely in your home without triggering an alarm. In the “Away” mode, used when you leave your home, there are interior sensors that are also armed – meaning an intruder moving about within the home will also trigger an alarm. Since doors are the most common place for an intruder to enter your home, we start there. You should have a door sensor on every exterior door, including the door from the garage into the home. This is the foundation of your alarm system is perimeter protection. Next come the windows you want to protect – with the window sensor. It’s best to focus on the windows on the sides and back of the house first, since they are less visible, and are therefore more attractive to a burglar. And as for those upstairs windows, you may decide to pass on those – unless a burglar can find an easy way to reach them. For rooms with lots of windows, a glass break sensor is a great solution. This device has a limited range in any direction (as long as there is line of sight), and that makes the glass break sensor an efficient and cost-effective component of your perimeter protection. When you arm in the “Away” mode, then you bring into play your interior protection detection device – the motion sensor. You’ll seldom see a security system without at least one of these, and they are designed for backing up your perimeter devices, for an extra layer of security. This sensor is generally placed in high traffic areas and detects movement. The best motion sensors are immune to pets up to 50 lb. Once you get your arms around the intrusion component of your system, then you can consider the other devices that work in conjunction with your system – so that you can feel protected and connected. Smoke & heat sensor – we recommend at least one with every system. Carbon monoxide sensor – another important life safety device. Water/flood sensor – if you have a burst pipe, you want to know right away. Remember – you should never be on your own when it comes to designing the right level of protection for your home with Wired or Wireless Security System. The advice we've provided on our blog is a good starting point, but you should have an in-depth conversation with our trained security professionals at Reed Security to make sure your Security & Automation system is the right one for you. 1. Call your alarm installation company before you start! Almost every issue can be avoided by planning ahead. It is also worth letting the monitoring station know the dates of your renovations, so they can respond appropriately if they get any unusual signals. 2. Be cognisant of wires. While many modern alarm systems are primarily wireless, be aware that alarm wires may be hidden behind walls, baseboards, ceilings, and other pieces of the house you may be dismantling. If you or your workmen see a wire you don’t recognize, find out what it is before you cut or damage it! Failing to do so can be a costly mistake. 3. Be careful what you paint! Many devices, such as door sensors and motion detectors, can be painted to match the décor of the house to some degree. However, make sure to check with your Calgary alarm professional first. Painting over the infra-red window on a motion sensor, for example, will render it useless, as will painting over the microphone on an audio glass-break detector. Smoke detectors and carbon monoxide detectors will also stop working if they are painted. 4. Don’t remove/remount anything you’re not sure about. I’ve seen painters remove a motion detector to paint behind it, then put it back upside-down. I’ve seen contractors remove alarm keypads and put the wires back in the wrong order. If you or your renovation team are not 100% certain about something, consult a Calgary alarm professional first! 5. Replacing door sensors can be a tricky business. If you’re getting a new door where there once was an alarm sensor, be very careful! Some security sensors are wireless, and can be relocated to a new door with relative ease; however, I’ve seen contractors throw sensors out with the old door, so be aware of what and where they are. Wired security sensors can be very difficult to manipulate in an old door frame, so call your Calgary alarm installation company to see if they can assist you. 6. Be aware of powered wires. Almost everything in an alarm system runs on very low DC voltage, so there is not too much risk to your safety in dealing with alarm wires. However, touching the wrong two wires together can seriously damage the equipment, leading to costly repairs or replacement parts. 7. When you’re finished, test everything! No one wants to find out three months after a renovation that the front door sensor wasn’t hooked back up properly. Open and close every door, walk in front of every motion, and make sure all the alarm zones are registering on your keypad. Again, if there’s any doubt, call your Calgary alarm company. Above all, don’t take risks with your personal safety or security! Incorrect installation of alarm equipment can be very hard to detect, so if there’s any question, make sure to have a Calgary alarm system professional come out to verify correct operation before putting your trust back in the system. That’s what we’re here for. 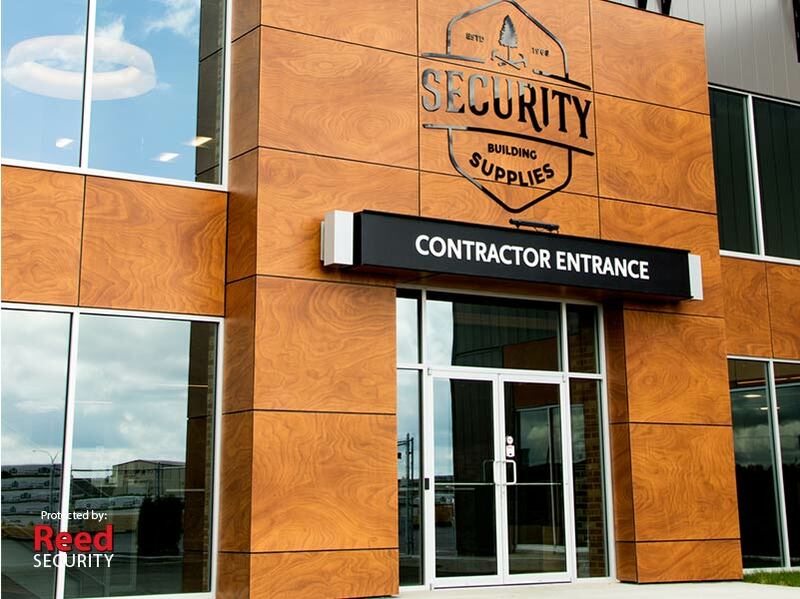 Security Building Supplies are veterans in the construction industry since 1968 and supplies lumber and building materials to home builders, renovators, and general contractors. 1. Reed Security proved to have the most detailed quote and provided the best pricing. Both the Sales Representative and the Owner drove to our facility to walk through exactly what we needed and give us advice on where they felt our resources were best spent. We didn’t know exactly what we wanted but we were presented with our choices and Reed Security made it easy to find the best solution for our facilities. 2. As well, the professionalism and expertise made Reed Security come across as a major player in their field. Our CEO was amazed to find out they were a locally grown business. 3. I would recommend Reed Security any day of the week for both residential and commercial solutions. From first contact with Reed Security right through until the completion of the project the staff was committed, a pleasure to work with, and most importantly knew exactly what they were doing. Reed Security made the process feel easy and straight forward when I am sure that isn’t close to the reality. 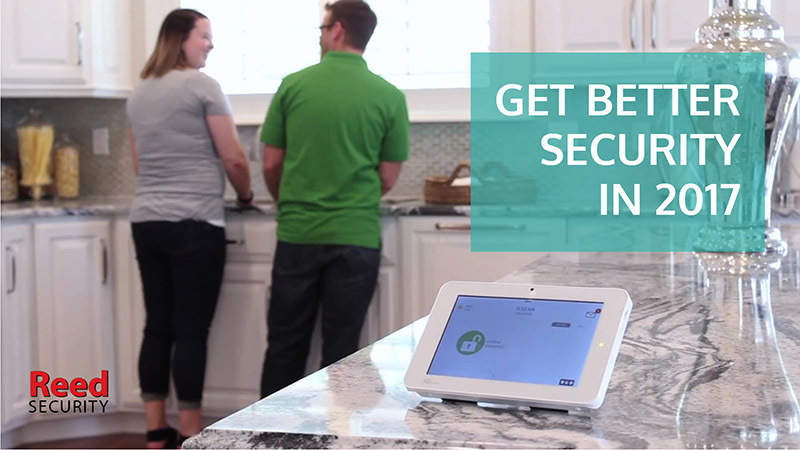 Reed Security makes Families Feel Safe and keeps them connected. We also help Businesses Re-gain Control and Grow their Bottom Lines. 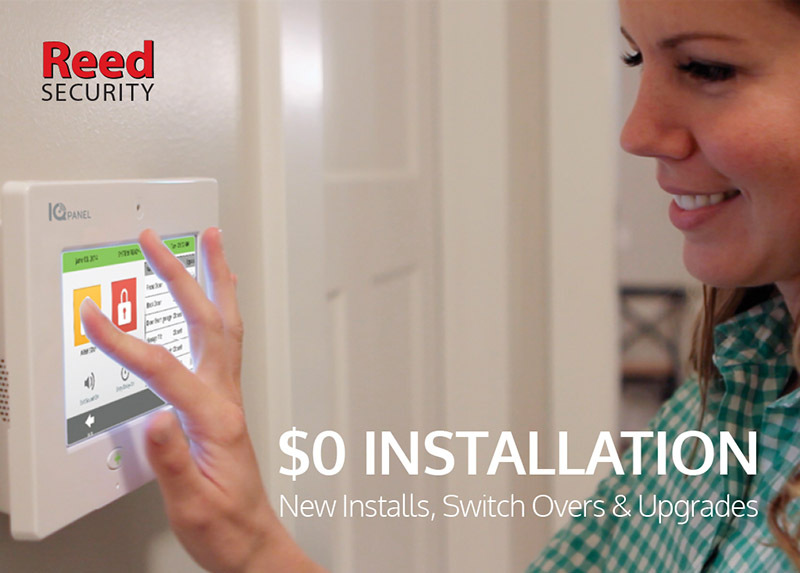 We've added some new $0 Down plans with *FREE Equipment + *FREE Installation. It's never been easier to Upgrade, Switch Over from a competitor or install a New Smart Package at your Home or Business. We also have new security bundles, LARGER easy-to-use touchsreens, free apps, e-mail alerts, arm/disarm with your smart phone, automatic doors, automatic garage doors, automatic lights, HD Wi-Fi doorbell cameras, no phone line options, smart thermostats, geo-services, video verification...and a whole lot more! WANT BETTER SECURITY IN 2017? 1. Update your Security System(s) Password and Call List. Did somebody recently leave your business? Did a neighbor recently move away? First Steps: Contact Reed Security by calling one of our offices listed below or by emailing support@reedsecurity.ca. We will need your Name, Address and Password. 2. Test Your Security System(s) monthly. b) Provide your Name, Address, and Password. c) Let the emergency operator know you would like to test your security system. d) Arm your security system and intentionally trip detection devices. (Let the siren sound as you trip door sensors, motion sensors, glass-break sensors, etc. e) After you have tested your security system again contact Reed Security’s 24/7 Rapid Response Monitoring Stations by calling 1-800-268-6870. The emergency operator will verify that signals from your security system have been received. 3. Review your existing Security System(s) and Procedures. First Steps: Document your current security system(s) and procedures. Did you experience theft or have an incident in 2016? Did your security system(s) and procedures work? Did you have adequate protection? What would you change? First Steps: When did you install your security system(s)? ReedHD™ cameras can record Faces and License Plates*. You can stay connected to your Home or Business with Alarm.com Smart Security. Control your security system, locks, lights and thermostat with *Free apps. You should consider upgrading your Security System(s) every 5 years.